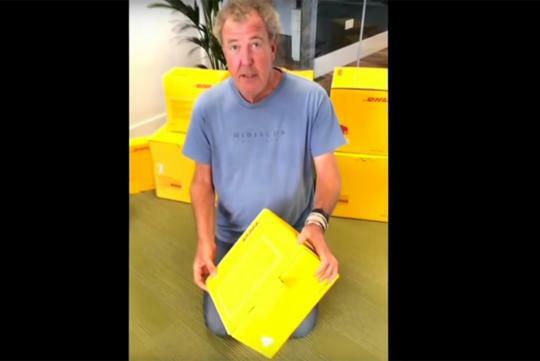 Getting viral on the web as we speak, a video of Jeremy Clarkson assembling a DHL cardboard box is becoming more popular than the new Top Gear series. Film by fellow colleague James May and Richard Hammond who is 'trying to help' him, netizens are declaring that the ex-Top Gear team is still way more entertaining to watch than the hosts at the new series of Top Gear. This comes after the news that the second episode of Top Gear has seen a drop in audience by more than a third, compared with last week’s series debut. For those who are wondering what does this has to do with the hosts and their new show, The Grand Tour, DHL is one of the sponsors and this 'DHL box Challenge' is part of their marketing campaign. Anyway, watch the two clips below and see who is the better one at folding boxes.